Imagine Noah Wiltson’s surprise when a hired killer gives him the means to live his life without doubt or fear. Noah Wiltson wants nothing more than to be left alone. His father’s candidacy for President forces him to have secrets. Imagine his surprise when a hired killer gives him the means to live his life without doubt or fear. The killer knows this hit is going to be his last. Whether he chooses to walk away or whether they kill him. He’s never been a team player, so he ends the game on his terms. 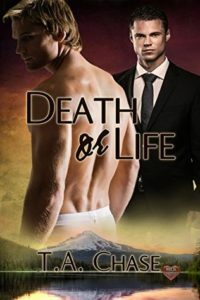 A few months later, Noah meets Cain Packert, a man who intrigues and excites him. Only one of them knows the truth. Can they find love amid secrets and threats? If I had to describe this book in just a few words it would be “off the chain”. This is a book that mainly revolves around 3 men. The first man is the reason all these men come together to begin with. His name is Noah. Out of every one in this book I would have to describe him as innocent. He would be the only one that I say has not done anything other be himself and has ended up with the biggest mystery surrounding him and likely to get him killed. And all of that is because he is gay. The other two men I would say this book mainly revolves around are Cain and Lord. These two men are completely opposites on one hand and then on the other hand they are more alike then they ever even really considered. One of these two men is killer that did it legally through the CIA and the other man is a killer that did it for hire for the highest payer. But are they both bad? Are they both good? Or is it that one is good and the other is bad? These are questions I found myself asking through the whole book. Well those questions and so many more. This is a book that has so many twist and turns that you feel like a pretzel by the time you have finished reading it and have untwisted all the different webs. This is definitely a book that keeps you on your toes from the beginning to the end. I also found it was a book that has you second guessing everything you thought you had figured out. I was definitely an exciting and interesting read. This was a book seemed to be a little lacking for TA Chase, but overall it was pretty good. This book just did not seem to have the usual excitement and interest as most books I’ve read from this author. The plot was great and there was some mystery in it but it just did work for me. There didn’t seem to be much connection between the MC’s, Noah and Cain. In fact I felt more of a connection between the secondary characters, Lord and Mars than Noah and Cain. The writing style as usual made it easy to read but sadly I just didn’t feel anything for the MC’s.